The new Home Secretary, Jacqui Smith, today urged Britain to increase its usage of shop loyalty cards and urged retailers who do not have the programmes to introduce them. Ms Smith’s statement comes in the wake of revelations that the Glasgow bombers acquired their supplies from the do-it-yourself specialist B&Q. "We would have been able to detect the preparations for the bombing attempts in London and Glasgow if we had more access to people’s shopping habits," she said in a statement to the House of Commons. "If B&Q had a loyalty card then this data would greatly enhance our intelligence gathering capabilities." 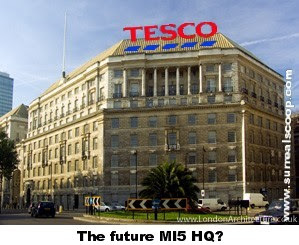 A spokesman for the leading retail espionage service, Tesco said that it has always worked closely with the Home Office and the intelligence community and denied that they were using the information for any sinister purpose. "It isn’t just about increased profits for the Tesco group, it is also about the nation’s well being," said Hamish Billingsworth. "For example, we have a comprehensive database of everyone who is, shall we say, making sure they get at least a glass of red wine a day. If you know what I mean." When quizzed about the invasion of privacy that the usage of such information entails, the Home Secretary was unrepentant. "The public rightly wants us to catch these murderers, but doesn’t want our national ID card scheme," she said. "Obviously if we had one single card and forced the stores to use that for their loyalty schemes we would not need to invade people’s privacy multiple times by searching through the shopping data from several companies." The government said that rumours it was in talks with Tesco over the running of any ID card programme were ‘wide of the mark’. "The plan is not just for the ID cards, but to outsource the whole of MI5 to Tesco," said the Home Secretary. "Frankly they seem to know more about what people in this country are doing than we do." Tesco denied speculation that it was planning a sting operation involving a Champagne delivery service to the caves of Afghanistan.